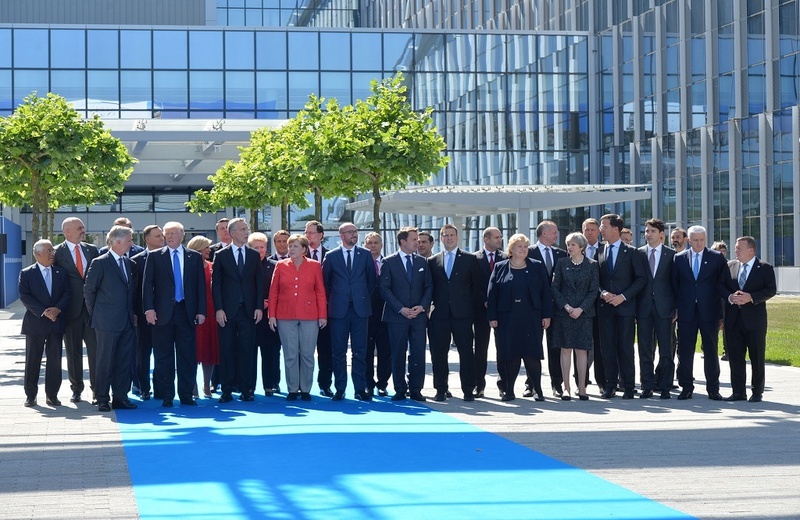 The NATO Heads of State meeting held in Brussels on May 25 was the first one in which some of the protagonists of recent political life took part. For this reasons, there were high expectations worldwide about what those protagonists would say not only about NATO alliance, but also about foreign politics in general. Donald Trump on NATO: More money from the allies, less commitment from the US? As stated in a previous post here at Changing World during the American presidential campaign Donald Trump declared several times that NATO members should ‘pay their fair share’ of the budget of the alliance, i.e., to allocate 2% of the national GDP to defence and armament. This subject has been debated during the meeting, leading to the declaration of NATO Secretary General Jens Stoltenberg that budgetary improvements has been already made by several NATO members. Nonetheless, Mr. Trump attacked quite directly the countries that are not yet paying their ‘fair share’. Even if not explicitly summoned, Germany was the principal aim of this attack because, while being the strongest economy in Europe, it allocates only 1.20% of its GDP to defence. The reaction from the European allies was one of dismay, and Mr. Trump’s assessment did not contribute to ease the differences between the political views regarding NATO on the two sides of the Atlantic. On the other hand, Mr. Trump imposed on the meeting’s debate the possibility for NATO to directly join the anti-ISIS coalition and strengthen the allies’ commitment against Islamic terrorism, being blunt while stating that without stronger commitment attacks like the one occurred in Manchester will never cease. Finally, it was expected that the US President would explicitly affirm the value of Article 5 as a symbol and means of collective commitment within the alliance. The fact that Mr. Trump did not say anything about the value of this article has been interpreted either as a direct attack to NATO alliance and values or as a ‘definitive win for Vladimir Putin’. The recently elected French President Emmanuel Macron kept Europe and European Union as main references during the summit in Brussel. Mr. Macron said to the press that everything must be done to avoid the destruction of Europe, a statement that clearly involves a European military cooperation and the relation with NATO. Although the reason for the meeting in Brussels was debating the financial commitment of the NATO members and the fight against ISIS, an important part of Mr. Macron’s activities in Brussels had a pure political nature. The French President met his American homologue in the American embassy in Brussels, where they talked about French-American relations, the Syrian crisis and the Paris agreement on climate change. The fact that Mr. Macron told the press that the conversation was ‘frank and pragmatic’ and that they did not necessarily share the same views on some points could be interpreted as the existence of wide differences between the two Presidents. Regarding the NATO meeting, German Chancellor Angela Merkel affirmed that Germany is on the right path with its defence spending, and that the 2% GDP objective will be reached within 2024. Nonetheless Angela Merkel underlined her political view, in contrast with Mr. Trump’s meeting with the former US President Barack Obama in Berlin just before the NATO conference in Brussels. After the encounters between the Chancellor and Mr. Trump in Brussels and in Taormina for the G7, Ms. Merkel stated – quite surprisingly because of the tone she used – that the EU must ‘take its fate into its own hands’, marking the important gap between Germany and the US. It is quite clear that this distance between Germany and EU countries can have several consequences regarding the eventual birth of a European common defence and the Atlantic alliance. Turkish president Recep Tayyip Erdoğan had a quite busy summit in Brussels, and his presence at the NATO encounter raised curiosity regarding how European and American leaders would have received the Turkish president after last year’s failed coup and the April referendum that considerably increased the latter’s powers. From a strict military point of view, Erdoğan emphasised that terrorism is still an important, global problem and the fight against it should have high priority, starting with a collective work of gathering and sharing of intelligence among NATO allies. It is quite clear that Erdoğan’s main interest is in Syria is the containment of the Kurdish-Syrian militias YPG, possibly even more than the fight against ISIS. From the point of view of the relations between Turkish and the other allies, the strained relation with Germany and France after the arrest of French and German citizens following last year’s attempted coup have not been improved; Ms. Merkel threatened to withdraw German forces from the İncirlik air base in southern Turkey if Mr. Erdoğan would not allow German MPs to visit the troops that are stationed there. This prohibition was due to a resolution passed in the Bundestag recognising the Ottoman massacres of Armenians during the First World War as genocide. In general terms, Mr. Erdoğan is now facing the consequences of the anti-European narrative that he adopted after the coup and during the referendum campaign – a narrative that strained considerably the relations between Turkey and European nations. It seems that US President Donald Trump is the only reliable Turkish ally, considering that he was the only important leader to congratulate Erdoğan after the referendum win; nonetheless Turkish contraposition against YPG, in turn supported by the US, can potentially spoil the relations between the two powers. Heads of States and/or Government at the NATO headquarters. Photo by NATO / Public domain.